Shure BLX188/CVL - The BLX 188 is a perfect wireless system for multi-microphone presentations. 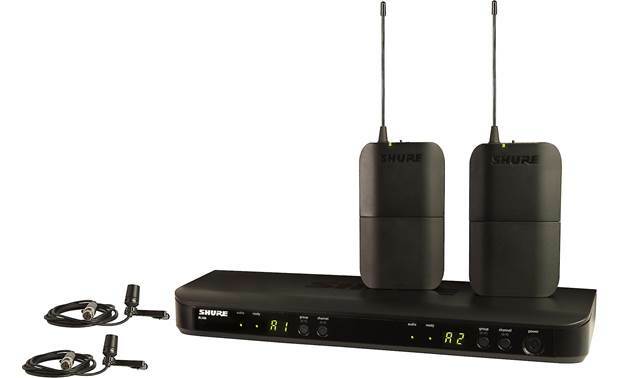 Shure's BLX188/CVL wireless lavalier system includes two CVL lavalier microphones, two BLX1 bodypack transmitters, and the BLX88 dual-channel receiver. This package offers discreet amplification and freedom of movement when you need multiple mics for instructors, educators, or any speakers who don't want to be tethered to stationary mics onstage. It's simple to set up the system's transmitters and the receiver. Press the Group button on the receiver and it automatically scans for the clearest group and channel. Then just set the transmitter to the same group and channel settings and you're ready to go. You can also set the Group and Channel manually, plus you can run up to 12 systems simultaneously depending on channel availability and RF environment. The CVL lavalier microphone offers unobtrusive miking for spoken-word applications, while the BLX1 bodypack transmitter completes a light and portable wireless solution. The BLX188/CVL system offers understated appearance and freedom of movement, delivering Shure sound quality in a simple package. Overview: The Shure BLX188/CVL is a dual channel wireless lavalier microphone system operating in the H10 frequency band (542 - 572 MHz). The system includes two CVL lavalier microphones with two BLX1 bodypack transmitters and a BLX88 dual channel receiver with microprocessor controlled internal antenna diversity. It's One-touch QuickScan frequency selection will quickly locate the best frequency and you can operate up to 12 compatible systems per frequency band (depending upon your region) with a range of up to 300 feet. The Shure BLX188/CVL combines professional-quality sound with a simple and intuitive interface, making it ideal for lectures, presentations, and conferences. CVL Microphones: Included with the BLX188/CVL system are two CVL lavalier microphones. These discreet tie- or lapel-worn condenser mics feature a cardioid polar pattern, with excellent off-axis rejection for higher gain-before-feedback when used with a stage monitor, and a tailored frequency response of 60Hz - 12kHz. Also included are two windscreens and an attached 52" cord with locking TQG connector for a solid attachment to the transmitter pack. BLX1 Transmitters: The two included BLX1 bodypack transmitters feature an easy-access On/Off switch and LED power indicator on their top section. A fold-down cover allows access to the Group and Channel selection buttons, along with a 2-character LCD display and a Gain adjustment dial. This section also holds the 2 included AA batteries, providing up to 14 hours of use. Each transmitter has a convenient clip for attaching to a belt or pocket. BLX88 Receiver: The BLX88 Dual Wireless Receiver features one-touch QuickScan frequency selection to help you find the best open frequency for less interference. You can also manually change the group and channel assignments, if needed. The rear-panel includes dual XLR mic-level and dual 1/4" instrument-level output jacks. The BLX88 is simple to set up, and has a microprocessor-controlled internal diversity antenna system. Each channel has two LED indicators. The audio LED indicates the strength of the incoming signal, and glows green for normal and red for overload. The ready LED indicates the system is ready for use and receiving the transmitter signal. It is powered by the supplied 12-volt DC power supply. Searches related to the Shure BLX188/CVL Wireless dual-channel lavalier microphone system (542-572 MHz, Band H10).